North Allegheny Senior High was recently ranked one of the best schools in the nation. 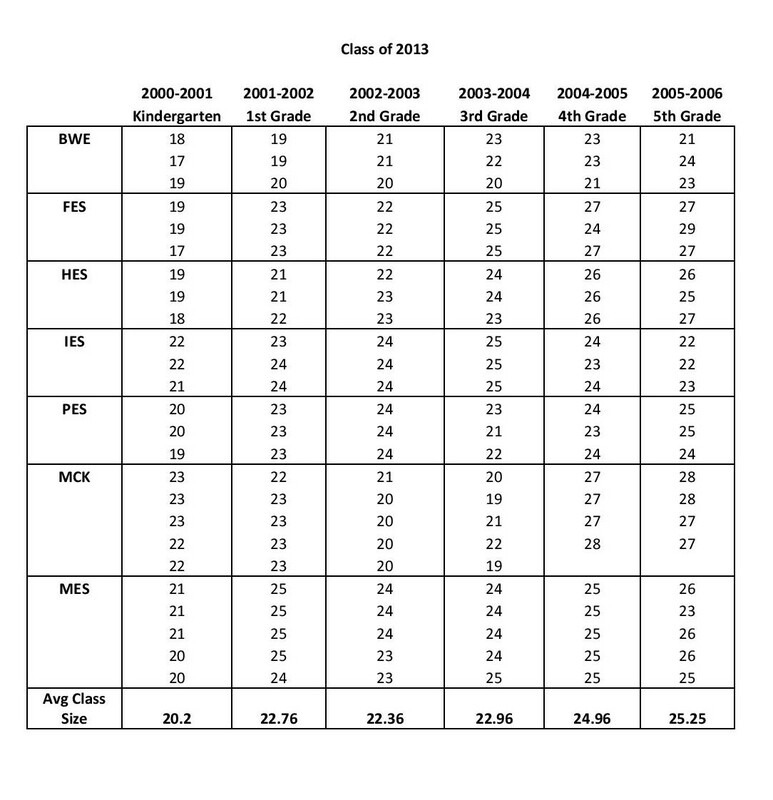 We thought it would be interesting to look at the elementary class sizes for the Class of 2013. The Class of 2013 NEVER had an elementary section above the district’s guidelines. There was NEVER an elementary class with 30 or more students. The average class size for 3rd grade was BELOW 25 students. Thus, 3rd grade operated as a primary grade. There are currently 13 elementary sections operating ABOVE the district’s guidelines. There are currently 8 elementary classes with 30 or more students. The average class size for 3rd grade is ABOVE 25 students. Thus, 3rd grade is operating as an intermediate grade. 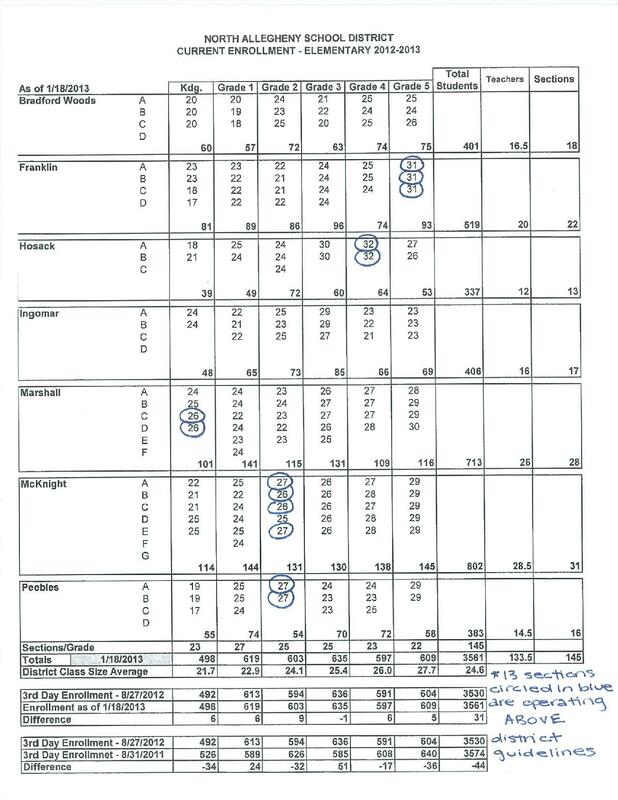 Given elementary enrollment has been increasing, class sizes have been increasing, and there are 850+ proposed new homes across the district, NA will be wed to higher class sizes if the board votes to close a building. If the board votes to close a building, the district’s successful elementary education model, which has withstood the test of time, would be replaced with a new model. The new model will include more sections per building, higher class sizes per section, and fewer spare classrooms to manage fluctuations in enrollment. If the board votes to close a building, the district will be taking a gamble with our current elementary school students, and no one knows what the results of the new education model will be for the Class of 2025. Make that 15! For most of the year the Hosack 3rd grade has operated at 30+ students. 30 or 31, either way, over 25 is unacceptable. For all of us that are so deeply invested in this process, it is crystal clear that a vote by the board to close PES will be very damning at best, and indeed shape a future for the elementary kids that could compromise and diminish their learning opportunities, not to mention other fallout in the community, but lets keep the kids interest in the forefront. From a reasonableness perspective, there is no tangible or rational evidence or statistics that even remotely support a school closure. In fact, there are overwhelming circumstances not to close a building when the impact to current and future class sizes are considered among other things, i.e expense save, property value, etc. And let’s not forget that anyone with any reasoning from a financial prudency perspective would not close a building that needs no repairs. With all that I have seen so far in this process, the Board is not even attempting to listen to what we have proven to be the right next steps, and minds are and have been made up to fulfill the administration’s recommendation to close PES. Just look at the canned and benign responses that the community gets in this process. I perceive the board chair to be the root cause of the resistance and also an undue influence to other board members behind the scenes to enjoin her in the mission to close PES. I see a vote scenario to close PES at 6 (in favor) and 3 (opposed) which now seems to include the most recent “interim” appointment in the “in favor” camp which just feels like another example of crooked politics to me! I think Ms. Boujoukos’s vote will be allowed in this process and I am certain as to which way she is headed! We are at the juncture now where those of us who advocate for saving NA schools need to find a drastic measure to be heard and continue to stop this shameful process. We keep showing up and investing in the best and future interest of these children and they keep saying, “Your five or two minutes are up”! Like I said “SHAMEFUL”! PES is a jewel in so many regards and the administration and board has seemingly turned a blind eye to our first hand and intimate knowledge of how valuable PES is in the educational and developmental aspects of our children’s day to day lives. Whatever their real agenda is here, it appears to be more critical than protecting the kids and community. The vote is fast approaching and with what I perceive to be a vote that is largely pre-determined to close a building………WHAT IS NEXT FOR US THAT GENUINELY CARE TO PRESERVE OUR SCHOOLS? Review the provisions of the Pennsylvania Constitution that deal with the removal of elected officials from office. Article II, Section 7 of the constitution authorizes state courts to remove an elected official upon criminal conviction of an infamous crime; Article VI, Section 6 provides for impeachment of elected state officials for misbehavior in office; and Article VI, Section 7 authorizes the removal of civil officers from office upon conviction of an infamous crime, misbehavior in office, or reasonable cause. 1) Will an increase in class size resulting from the closure of an elemenatry school today negatively impact the quality of education the class of 2025 receives over the next 12 years? I think it most certainly will. 2) If the quality of education the class of 2025 receives is compromised, will that negatively impact our property values? I think it most certainly will. Let’s face it: everyone in this school district paid a premium for their house based on the quality of the education in this school district. If the quality of education here decreases, we will not be able to sell our houses at that same premium. Many of us could end up selling at a loss. We have an opportunity to keep this from happening people! Speak with your vote on May 21! All I can do is laugh! I don’t even know what to say it’s so ridiculous. After reading this it’s no mystery how and, or why our country’s falling apart every which way but loose. Instead of improving on something that’s not broken, or fix something that is broken, the board has decided to destroy something that was working above their standards, because it’s easier then raising the bar. May I congratulate on board not only on their decision to assist our country’s education system fall further behind, but also for it’s inability to hear an opinion that is opposite to theirs. Is this board elected or appointed? Well, maybe a process should be started to correct that. I can not understand their reasoning behind this. PES is an amazing school. The teachers are top notch & the Principal is by far one of the BEST out there. What about them? If we increase class size then our kids get lost in the shuffle and testing scores go down. PES is in no need of repairs so why close it? I am so outraged over this. Maybe it is time for an entire new school board. We as parents and taxpayers should have some input into this. It is my child and countless others who will be affected by this. Not theirs. I live here because of PES!!! So sad and the district is being selfish!!! Absolutely correct, Jennifer. Our way to have input with this School Board is to VOTE (May 21st) for candidates who will put our children first. Please vote for Tara Fisher, Ralph Pagone & Scott Russell. They (with Chris Jacobs) will re-orient this Board back to where it should be. One of the roles of a School Board member is to be a representative of the community. Several of our current School Board members have lost their way and have succumbed to administrative influence and personal agendas.